The movie that induced Sean Connery to hang up his theatrical tights, such was the misery of making the damn thing. Sure, he’s done a bit of voice work since, as a nod to his Scottishness, but this will remain his final feature. We’ll never get to see that repairing with Michael Caine (just was we missed out on a Redford/Newman trio). Hackman hung up his saddle at about the same time (and at about the same age). It’s not that you begrudge actors in their 70s retiring, not at all. But you wish that, if it were a conscious decision, they’d choose something that stands a more fitting epitaph. There were three years been Connery’s previous film and League. That one, Finding Forrester, would at least have seen him bow out on a respectable note. Still, at least he’s enjoying all that golf. The source of much of the Scot’s ire on League was director Stephen Norrington. Indeed, whole articles have been written about the disenchanted. Three decades plus younger than his star, the fall-out from the film also clearly had a profound effect on Norrington. He hasn’t directed a feature in the subsequent decade (this isn’t the sort of film to get a proud 10th anniversary release…), although his name has been sporadically attached to in-development projects. Norrington had one major credit to his name when he embarked on League (his fourth feature); Blade, a Marvel property that had the edge on the rebirth of the superhero movie by a good couple of years. At very least, his choice to adapt an Alan Moore comic book showed he had an eye for material. But so did the Hughes brothers, and their adaptation of Moore’s From Hell had also stumbled. Not as profoundly as League would, but sufficiently that there seemed little of Moore’s distinctive sensibility left. At least From Hell possessed a full-blooded, tangible version of Victoriana courtesy of cinematographer Peter Deming. Unfortunately Norrington’s depiction of the period would be an ugly, clumsy, CGI-by-way-of-steampunk monstrosity. He may have an excuse, in that League was rushed for a summer 2003 release, requiring effects to be farmed out to another house. And disaster struck the Prague sets, puttiing the production further behind schedule. But that doesn’t explain the graceless designs of the Nautilus and Nemo’s supercar, both of which give rise to blocky, thundering, action sequences that illustrate the director’s lack of finesse. The sinking of Venice set piece in particular is quite ghastly to behold. Norrington was reportedly neither comfortable with the Fox’s micromanagement (they’re weren’t known as the most director-friendly studio back then, and still aren’t), nor the sheer scale of the production. If Norrington has remained quiet about the combustive atmosphere, Connery held forth on several occasions (“On the first day, I realise he was insane” he said of his director). Neither Moore (who will no longer countenance even a glance at film versions of his work) nor artist Kevin O’Neill were impressed by the changes made to the comic book. Moore’s basic idea, to collect together famous fictional characters of the period as a kind of Victorian proto-Avengers, has obvious big screen potential, but the artlessness of the result compares to The Avengers, another British property Connery seemingly hexed five years. James Dale Robinson, a prolific comic book writer, was tasked with the adaptation (curiously he also appears to have steered clear of screen work since), and promptly threw out much of the Moore’s storyline. At one point, following the curiously blinkered thinking of Fox execs (who were clearly blind to the popularity of the thoroughly British Bond franchise in the USA), a draft transposed most of the action to America. In the end, the sop to home-grown audiences who clearly “needed” an identification figure (and a young one to boot), Tom Sawyer (Shane West), wasn’t so much massaged as crudely overlaid on the action. He became Allan Quartermain’s (Connery’s) young apprentice. Sawyer is a blight on any nuance the movie might have offered, underlining every moronic action beat one would expect of a big dumb blockbuster. He even exclaims “Care for a spin?” at one point has he takes command of the Batmobile, I mean Nemo’s car. Sawyer is indicative of the obnoxious approach taken throughout. In the comic, the League was led by Mina Harker (Peta Wilson). Who wasn’t a vampire. Here, Quartermain is very much calling the shots. 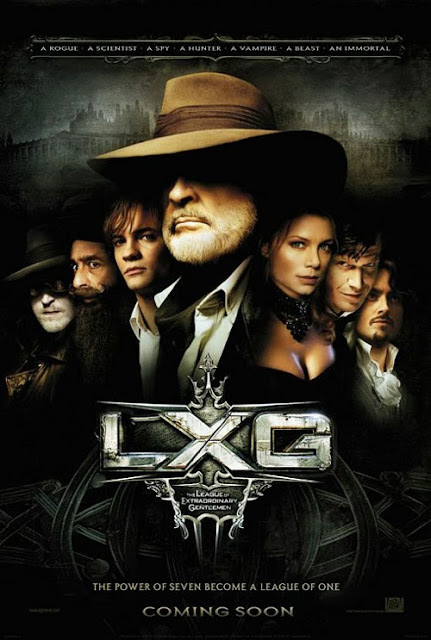 There’s Captain Nemo (Naseeruddin Shah), Rodney Skinner (Tony Curran as “an” invisible man; rights issues presented using the original Wells character), Dr Jekyll (Jason Flemyng) and Dorian Gray (Stuart Townsend). Ironically, Gray isn’t utilised in the comics. Ironically, as he’s probably the best-depicted character in this mess and Townsend certainly gives the most interesting performance. Curran and Flemyng are fine as a cheeky chappy geezer invisible man (never in a million years would the activities of the comic book invisible man have been replicated by the movie) and a nervous/savage, man/monster respectively. Some reports have it that Flemyng took the role after a number of actors turned the part down on account of the prosthetics involved. Any self-respecting actor who had seen the designs would said no to Hyde on account of the aesthetics; he’s a wretched combination of make-up and CGI, an unintentionally comic version of The Incredible Hulk. All the characters have a surfeit of requisite references to their troubled histories (“Your own past is far from laudable” blah blah), often with groan worthy predictability. Where they do escape with a modicum of dignity intact it’s because the actors are able to lessen the blows of dreadful dialogue. One of Moore's villains was Fu Manchu. Whether Fox replaced him with the Fantom because (as reported) the rights were unavailable/too costly or they were sensitive to the possible racist implications of reviving him is unknown. Without doubt, however, is that Richard Roxburgh is absolutely dreadful as M. I’m unconvinced it was the most dazzling stroke of invention for Moore to fall back on this particular criminal mastermind anyway (in this respect, the film follows the source material). He’s a lazy, one-note (one-initial) character based on a much-over used iconic villain and played by a charmless ham actor (who inflicted more charmless ham on the big screen as another iconic villain, Dracula, in another lousy franchise non-starter, Van Helsing, the following year;). It’s been suggested that the size of Connery’s salary prevented bigger names from being harnessed for the rest of the League (Monica Bellucci was up for Mina, but schedules clashed), but that isn’t even on the radar of reasons for this movie’s failure. The “super team” structure inevitably results in time spent assembling the members. That’s part of the fun, or at least it should be. But everything about Norrington’s film feels cack-handed form the first. And when the League is established an inordinate amount of time is spent in transit on the Nautilus (Avengers did something similar with a middle act on the helicarrier, but at least that had some intrigue). Never a studio to let rights lapse (well, Daredevil excepted), as witnessed by their dogged determination to milk every last dollar out of X-Men as returns slowly diminish and their persistence in rebooting Fantastic Four, Fox has announced plans to refurnish League but this time in television form. Showtime’s production of Penny Dreadful, a Victorian monster series from John Logan and Sam Mendes, is probably not coincidental to this decision. Penny Dreadful features the likes of Dorian Gray, Van Helsing and Victor Frankenstein. It also has a promising cast, and Josh Hartnett. The TV League probably couldn’t be any worse than the film, but it’s already playing catch-up (shades of Warner Bros/DC’s clueless attempts to rise to the challenge of Disney/Marvel). Fox have, to be fair, produced some very good fantasy television (although their track record in killing off difficult progeny before they have a chance to blossom is also marked), but there’s little doubt that Alan Moore won’t be happy however it turns out.